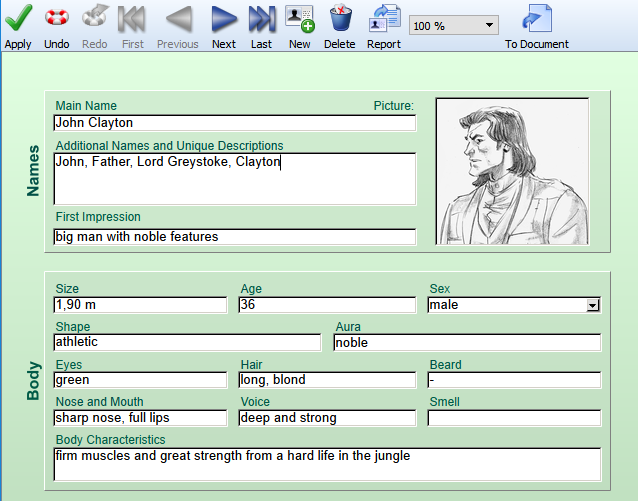 In the Character Database you can record and develop the characters of your story. You suddenly discovered something illogical in your story or a great idea arose that requires a few changes earlier in your story? 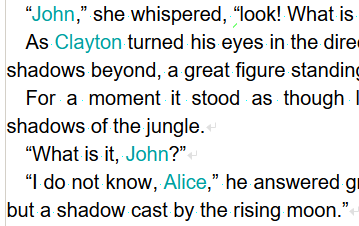 It’s time to start searching, but, if you mentioned your character without using his actual name, you will have to search for clues to find him in your text. Though not, of course, if you have entered him into the Character Database. Create a new Character Database for your story by clicking on the icon in the toolbar. If a Character Database does not already exist for your text, you will be asked if you would like to create one. In the Character Database, each character you created is given his or her own page where you can enter important characteristics. This allows you to create vivid characters and ensures you won’t lose track of them. The special feature is that the characters in your database will automatically be linked to the appropriate text passage. 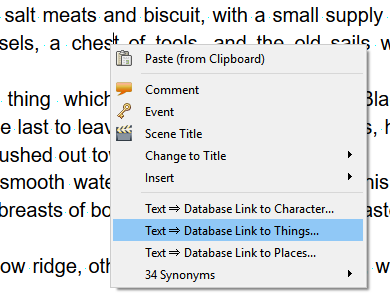 This link, named “Text ⇒ Database Link,” goes from a spot in your text directly to your data entry. This is unique, so again: It is not simply a hyperlink from the text to another spot in the text, but rather a jump to a specific data entry in your database. In this case the character page of the corresponding protagonist. By double-clicking on this text passage, you will open the linked data entry in your Character Database. From there, you can look up the description of your character and add to it, if needed. For efficiency reasons, the character links in the text are not continuously updated. You can refresh them with the icon or by selecting “Update Auto Links to Characters etc.” (Menu: “Document” → “Indices and Directories”). In order to link your story to a Character Database, you need to tell Papyrus which database your story belongs to. For every story without a Character Database, you can create a new one by clicking on the icon in the toolbar. 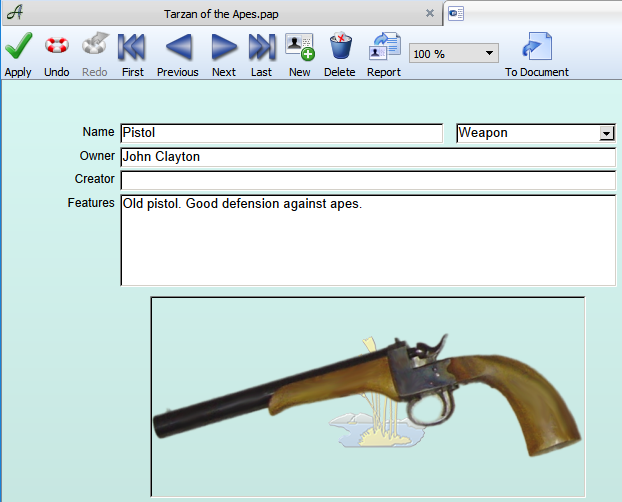 A Character Database will then be copied and automatically linked to your text. This also happens automatically if you begin with a “New Project” (Menu: “File”). If you would like to link another, already existing database to your text (for a sequel, for example), you can do this in the Character Database dialog (under “Indices and Directories” in the menu “Document”). In the appearing window, choose the database table(s) you would like to link to your story. In this dialog, as mentioned above, you can create a new Character Database for your text or choose one that already exists and link it to your text. 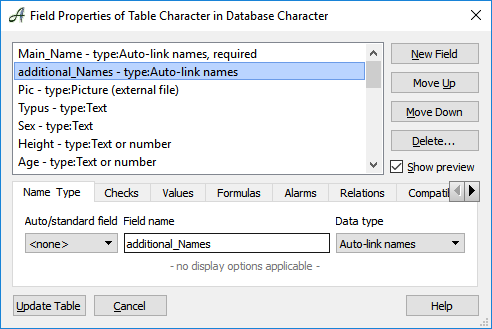 Please be aware that you cannot just add any database of your choice to your text–the structure of the tables for characters/items/locations must be the same as the original and the first fields must be marked as auto-link fields. If you would like to change any of these tables, we recommend using the database that comes with Papyrus as a reference. It is a good idea to leave the structure of the tables as is and to leave the first few fields of each table alone. The rest of the tables can be edited as you choose. Papyrus searches your story for every place where you have referred to a character and creates a link between this place in the text and your Character Database. You will then be able to see which chapters your character can be found in via the Navigator (and, if you so choose, how often). Papyrus uses the names in your Character Database to find these places in the story where your characters appear. Papyrus looks up not only the character’s main name, but also any additional names and pseudonyms entered under “Additional Names and Descriptions”. All descriptions will be understood by Papyrus as “hits” and any text passage in which they appear will be linked to your Character Database. Simply enter all names and descriptions, which you would like detected and linked, in the “More Names” blank, separating each one with a comma (either with or without a space). In both the “Main Name” and “More Names” fields you are allowed to use names consisting of more than one word, e.g. the “black widow” (the name can be up to four words long). For the character “Lucifer,” for example, the names “Devil” and “Satan” should also be entered in the “Additional Names” field–everything you will use in your text. Each time one of these words comes up, Papyrus will know that this character is present in this chapter or scene. Non-fiction authors can also make use of this function. Relevant terms that you would like to see clearly in the overview of your contents can also be entered into this database. It’s also possible to link text passages to your database entries manually. This text passage will then be linked to the appropriate data entry in your Character Database (even when Papyrus would not be able to detect the character automatically). Your manually created Text ⇒ Database Links will still remain intact when your links are updated. In the Navigator tab “Characters” you will find a list of all the characters that appear in that chapter and, if you wish, how often they appear. Additionally, you can use this column to plan which characters you would like to include in the chapter. Under “Available in Character DB” you can expand a list of all the already existing characters in your database. 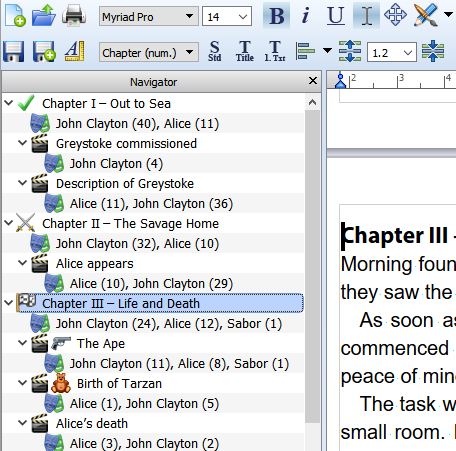 Use your mouse to drag and drop the characters you want into the “Planned in Chapter” list. You can “Remove” them again with the button at the bottom of the column. If a new character comes to your mind while writing, you can use the “Create New“ button to directly jump to the Character Database and enter your new character. In the “Navigator Display” at the bottom of the Navigator you can decide which characters should be shown in the Navigator (as well as in the Timeline tab). The colors in the circles represent the characters in the Timeline Window. 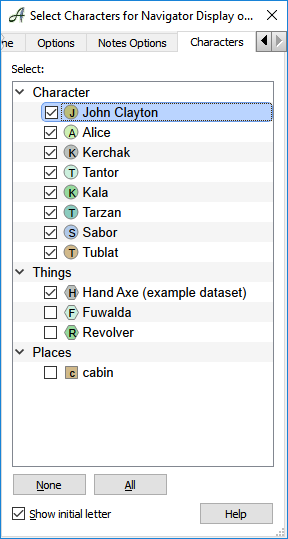 In addition to characters, the “Things” and “Places” in your story also have their own tables in the Character Database. For these tables we have created specific fields, which can be used to create a link to an external document or a website. These links can even be an audio file or a video that can be played in the media player on your computer. An internet link will simply save a URL, which will then be opened in your browser.